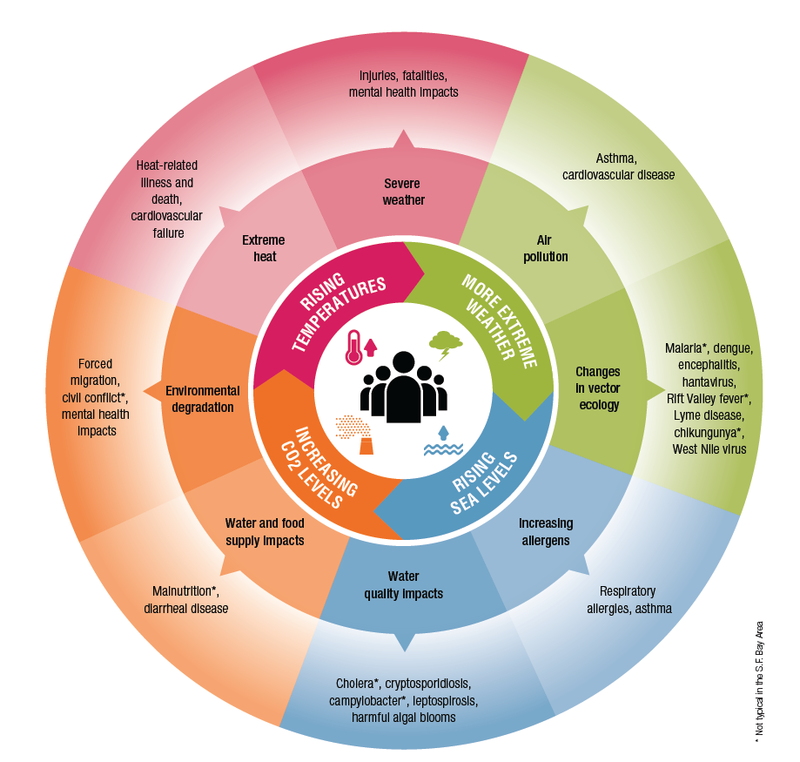 Climate change impacts a wide-range of health outcomes. This page illustrates the most salient climate change impacts, their effect on exposures, and the subsequent health outcomes that result from these changes in exposures. Extreme heat is the #1 cause of weather-related deaths. Cities are often significantly warmer than rural environments. The phenomenon is called an ‘urban heat island’. San Francisco is particularly vulnerable to extreme heat because much of the infrastructure, housing, and residents lack the technologic, structural, or physiologic adaptations necessary to withstand severe heat waves. Extreme heat can exacerbate the effects of pre-existing conditions such as renal failure, heart-disease, or diabetes. Extreme-storm events will increase in both frequency and severity over the next 50 years. Heavy winds, lightning, and rains could cause fatal and nonfatal injuries by either damaging infrastructure or increasing automobile and pedestrian-related injuries. Personal, municipal, and corporate income lost due to damaged infrastructure, power outages, transportation delays, and business closures indirectly impacts public health. Warm and dry weather expands the blooming season for ragweed and other allergens. Temperature increases will accelerate the creation of ground level ozone and other fine particulates. Exposure to ozone and particulates will increase asthma and respiratory illness rates, especially in children. As climate change increases the frequency and severity of wildfires in rural California and the Western United States, urban air quality will be impacted as weather patterns will carry smoke and other particulate matter into cities. West Nile Virus is growing in the San Francisco Bay Area. Since 2012, there have been 3 reported cases of West Nile Virus in San Francisco, 6 in San Mateo County, and 350 in Santa Clara County. As temperatures rise, a particularly wet season will lead to an increase in mosquito populations and increase San Franciscans’ risk for West Nile. Chikungunya a tropical mosquito-borne virus that causes fevers, headache, and a long period of severe joint pain, has been reported recently for the first time in Florida and has the capability to spread further. In the past, fluctuation in precipitation levels has increased rodent populations and lead to an increase in Hantavirus. Heavy winds will cause pollens to become airborne. With both a temperate climate and old housing stock, San Francisco is a fertile environment for mold growth, and its residents are at increasing risk for mold-related allergies. San Francisco gets 85% of its water supply from the Tuolomne River watershed. In 2013, San Francisco water infrastructure was threatened by the Rim Fire. As wildfires increase throughout California due to climate change, San Francisco’s water supply will be increasingly at-risk. Sea-level rise and extreme storms could lead to an increase in standing water and/or a corruption of the city sewage, wastewater, or drinking water infrastructure. Although bacteria, viruses, and parasites flourish in standing water, the most common water-borne conditions during the aftermath of Hurricane Katrina were skin and wound infections. An extreme drought could limit California agricultural output and increase the price of produce in San Francisco. In drought years, San Francisco will have to require water rationing. In children, food insecurity has been linked to increased rates of cognitive developmental deficits and behavioral and psychological dysfunction. Hazard events are linked to mental and behavior health stressors and can increase rates of anxiety and depression. As the population of San Francisco, the Bay Area, and the Central Valley grow, increased demand for limited water resources could increase the cost of water and the need for new infrastructure. During flood inundation events, leaking underground storage tanks and other hazardous materials sites pose a significant risk to neighboring communities.